This page has hundreds of topics to use in debates, and we are continually updating our list. If you’re stumped for ideas for your debate team, tournament, or essay, use this list as a starting point. With this topic guide, you can make a decision more quickly and get to work on crafting your argument. You may also check out our list of argumentative, controversial, and persuasive topics for more debate subject ideas. With high levels of conflict and emotion involved in a debate, the pressure is on to choose a good idea for a topic. Choosing good debate topics can help participants learn to understand both sides of an issue while also encouraging an audience to make better-informed decisions on where they stand. Interest – Think about what interests you. What do you think would be fun and interesting for you to debate or write about? Also, think about what you and others can benefit from discussing and understanding. Relevance – Choose debate topics that are currently relevant and have recently received high media coverage. The topic should affect many people in the discussion and in the room. Opposing viewpoints – There must be opposing arguments within the group or that can be addressed in an essay. The topic should be complex enough so that serious research can be done on both sides of the argument. Empirical data – The topic must be able to be analyzed and critiqued. How can different sides of the issue use factual information? It may help to choose one concrete case to discuss rather than debating a topic in general. Invite criticism – You must be open to discussing the topic you choose and open to having your opinions criticized by others. You may want to avoid a controversial topic that is too personal for you if you cannot handle the criticism that will follow. Also, be careful to avoid topics that may be highly personal to other participants involved. There are countless options available to present an informative and educational debate. Below are lists of debate topics you may want to use for debate team practice, tournaments, or speeches and essays. Remember to consider your interests, relevance, and your comfort in the topic to choose the best debatable subject. Are credit cards more harmful than debit cards? How old should your child be before they get a cell phone? If we are becoming too dependent on technology. Is television an effective tool in building our children’s minds? Should people move in together before they are married? Whether you can have both a happy family life and a successful career. Whether you should live frugally and save for retirement or spend money now. Structured prayer versus spontaneous prayer. Benefits and limitations of teaching sociology in nurse education. Is competition necessary in regards to the learning process? What impact does social networking have on the classroom? Whether being a college graduate is necessary for a successful career. Whether students should be guaranteed two years of free tuition to a community or technical college. Whether an associate degree or a bachelor’s degree is more beneficial. Whether cell phones may be used during class. Whether it’s a good idea to have laptops in classrooms. Why all college campuses should or should not be co-ed. Animal testing for cosmetic products. Drug abuse and addiction as a choice versus a disease. Should euthanasia and physician-assisted suicide be legal? Whether drug prohibition minimizes drug use. Whether sexual orientation matters for marriage rights. Whether shall-issue laws are decreasing violent crime rates. Whether the death penalty is an appropriate penalty for certain crimes. Are spectator sports overemphasized in America today? Can cell phones be educational tools? The importance of reducing fossil fuel emissions. When should Black Friday sales start? Why pizza is the best food on the planet. Benefits of vegetarianism for health. Can the growing problem of obesity in the United States be reversed? Cell phone radiation as a cause of cancer. Should genetic engineering be utilized in food crops? Should sodas and sugary snacks be banned from schools? Whether milk benefit outweighs the cons of consuming dairy products. Flu shots are necessary for risk groups. If you can get a good job as a high school graduate. Why money should be spent to improve your school’s athletic complex. Year-round schooling is better for students. Should school prayer be prohibited? Do school authorities have the right to search student’s lockers? Adolescents having the right to make autonomous medical choices. Countries prohibiting the production of nuclear power. National security concerns being valued above personal privacy. Placing political conditions on humanitarian aid to foreign countries. The United States intervening in the internal political processes of other countries to attempt to stop human rights abuses. The United States limiting qualified immunity for police officers. The United States using private military firms abroad to pursue its military objectives. Are violent video games contributing to violence in the world today? Celebrities earning too much money. Do Photoshopped images promote unrealistic expectations of beauty and body image? Is posting videos online a right of free speech? Is the Indo-Asian news service biased? Is there too much pressure on girls to have perfect bodies? Which current musicians will stand the test of time? Do Hollywood movies have a bad influence on the world? All students being required to learn sewing. Grade 8 students being done with the school year before the rest of the school. Should students be required to wear a school uniform? Should the Internet be banned from schools? Students being required to learn a foreign language in middle school. Students should never be forced to repeat a year of school. Defending a decision of the Supreme Court, such as in the Roe vs. Wade case. Does capital punishment reduce the rate of violent crime? Should affirmative action be allowed? Should Hillary Clinton have won the 2016 presidential election? Could a President serve for more than two terms? Should states have more control over the implementation of Federal government decisions? Should the United States build a physical barrier along the US-Mexico border to stop illegal immigration? Should there be restrictions on free speech? What is the biggest threat to national security? Whether Donald Trump should be impeached. Whether Jeb Bush should have made it further in the presidential election. Whether the United States federal government should increase its funding for elementary or secondary education in the United States. Who really won the final presidential debate? Who the best or worst candidates were for the 2016 presidential election. Who the next Democratic candidate should be for the presidency. Who the next Republican candidate should be for the presidency. For-profit prisons in the United States should be banned. Hofstra University is the best place to host the presidential debate. Is Lester Holt the best person to choose the presidential debate topics? The United States Federal Government ought to pay reparations to African Americans. Whether Foreign Direct Investment multi-brand retail should be allowed in India. How can bullying in schools be stopped? How long should you have to drive with a permit before you get your license? How old should you be before you’re allowed to go on your first date? If posting students’ grades publicly is motivating or humiliating. If social media is ruining the way teens communicate. Should juveniles be tried and treated as adults? The Olympic Games a waste of money? Should teens play sports in high school? Should skateboards and any look-a-like large roller-skate wheel transportation devices be prohibited on sidewalks? Do adopted children have the right to know who their biological parents are? Should factory farming of chickens be banned? People in their 50s are too old to adopt children. Trial by jury is not objective. The Freedom of Speech Amendment must be applied to internet communication. 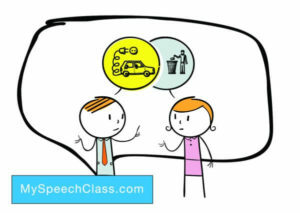 Cite this article as: Jim Peterson, "Debate Speech Topics," in My Speech Class, May 13, 2018, http://www.myspeechclass.com/debate-speech-topics.html. how can technology stop us from doing our hw…i feel that way right now! Should the Dutch go back in control of Indonesia?